Completion times vary depending on reading comprehension and your ability to answer multiple choice questions. We cannot provide you with a definitive answer to the actual course time. All DMV Approved Online Traffic Schools are regulated by the DMV and have a similar amount of reading material. You may be able to complete in an hour or less because there are no timers forcing you to stay in the course. You are not required to complete the course in one sitting - you may log on and off as many times as you would like. Complete the course in one short session or take as much time as you need. CitationStation.com has no hidden fees. Don't be fooled by others that promise you a lower price and then try to sale you services you don't need or want (i.e. additional fees for standard processing of your course completion). 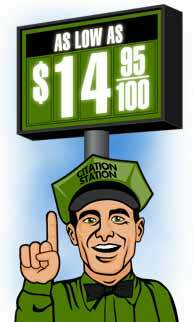 CitationStation.com includes the cost of the course and normal processing of your certificate for one low price. Expedited processing and services are available for a reasonable fee, but we give you the option to choose the service that best suits your needs. Third party Identity Verification is no longer as of January 2013. Changes in acceptable methods allow us to ask students a series of questions during the registration process. Those questions are then asked randomly during the course. This method currently satisfies the identity verification requirement and allows us to provide a service that does not require additional fees. Your privacy is important to us. We use Safe & Secure SSL encryption to protect your personal information. Please check the address line of your browser. You will see a symbol of a lock at the end of the URL that indicates that all information you provide is sent over a secure link. Please Note: We don't sell or distribute any of your information and only collect what the DMV requires. CitationStation.com is obviously more convenient than a walk-in traffic school course that requires a strict classroom schedule. However, you should sign up as soon as possible so that you may complete the course in plenty of time to allow for your Certificate of Completion to be sent to you or your Court and recorded by your due date. We accept Visa, Mastercard, American Express and Discover as well as cashier's checks, money orders. Most information may be changed by the student using the "Edit Profile" at the top of your student status page. Students may change due dates, billing address, driver's license number etc. If the County or Jurisdiction needs to be changed, please contact our office. I paid a traffic school fee to the court. Why do I have to pay CitationStation.com too? An e-mail address is not required. However, without an Email address you will not receive automatic notices verifying that we have confirmed your registration or completion of the course, notification from the court or any payment receipts. Click Here to sign up for CitationStation.com today!